For more instructions on how to do this with specific calendar programs click the "Need some help" link at the bottom of the dialog. You only need to add this link once to your calendar program. 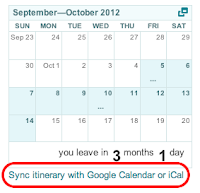 From then on, all of your trips, destinations, and items scheduled on your trip itineraries will show up under the same shared 'Planapple' calendar in your calendar program. You can always remove Planapple from your calendar program, just like you would any shared calendar (check your program's documentation to see how). 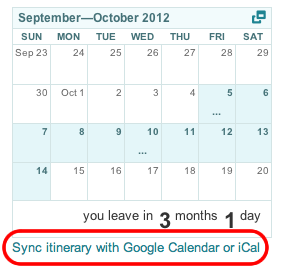 As with many shared calendars, you won't be able to edit your Planapple itinerary from your calendar program. For the moment it's "read only." To make edits you'll have to go back to your trip on Planapple. But any edits you make on Planapple to your itinerary will automatically show up in your calendar program (after some delay depending on the program). We hope you find this new feature handy. As always, let us know what you think with questions or comments via the "feedback" tab on the right.